One of Alberta’s foremost folk musicians—I believe only John Wort Hannam is her equal—returns with her sixth collection of lyrically-rich gems. An artist who places her convictions and heart on display in complementary proportions, Dunn has found balance between sharing the inspirational and compelling within songs that are insightful, artfully constructed, and just plain enjoyable. There will always be more than a bit of the Celtic lands in Dunn’s music, and throughout Gathering African, Asian, and Canadian First Nations influences can also be heard. An overarching theme of community connection is woven into each number, ably achieved through Dunn’s soulful lyrics and the contributions of collaborators including long-time partners Shannon Johnson, Jeremiah McDade, and Solon McDade [of The McDades]. As always, one comes away from this Dunn recording knowing more about the world than one was previously aware. Like the finest troubadours, Dunn communicates: she is the vessel through which others exist. She reveals the innermost, personal, and captivatingly universal perspectives and insights of devoted parents, the down-trodden challenged by circumstance, those connected to the land by more than choice, and the youthful who rise above. Beautiful stuff Gathering is, certainly one of the finest recordings to be released this year. Those who compare Maria Dunn to Woody Guthrie, Hazel Dickens, Jean Ritchie, and Buffy Sainte-Marie aren’t taking the easy way out: with the release of Gathering she demonstrates that she is an international folk artist of significance. Maria quotes the late Pete Seeger on the front cover of the lyric booklet to Gathering, her new and equally superb album: “The key to the future of the world is finding the optimistic stories and letting them be known.” And, indeed, that is what Maria has done with her 10 original songs on Gathering (there is also an excellent interpretation of the traditional “Jock Stewart” (also known as “I’m a Man You Don’t Meet Every Day”). The set opens with “Malala,” an anthemic tribute to Malala Yousafzai, the teenaged Pakistani girl whose brave and inspiring activism on behalf of education for girls led to an almost-successful attack on her life by the Taliban and to her becoming the youngest-ever Nobel Prize laureate. With her core accompanists on the album – siblings Jeremiah McDade, Solon McDade and producer Shannon Johnson, all of The McDades – augmented on this track by singer Karim Gillani and tabla player Ojas Joshi – there is an appropriate East Asian flavor to the arrangement. The character in the next song, “The Milkman,” is a refugee in a camp – in Africa, I presume – repenting the horrible actions he was forced to perform as a forced child soldier and hoping to turn his life around through positive action in a place so much in need of it. “When I was Young,” is a poignant piece sung from the perspective of environmental activist Dorothy McDonald-Hyde, the first female elected First Nations chief in Alberta while “Hans’ Song,” is from the perspective of an old man in Edmonton remembering his sister and the life he left behind as a young immigrant from Norway. Then “Little One” captures the general experience of so many First Nations people who went through the Canadian government’s horrible residential school system over the course of more than a century into the 1990s. Each of these songs, and the rest, are beautifully written, arranged and sung by Maria with great sensitivity to the people they reflect and to their unique and special stories. “How I Live” is a topical song detailing some of the difficult challenges, and the resolute determination, of people living with disabilities and their caregivers to live with dignity despite inadequate public support. A pair of songs, “Flora,” about a specific grandmother living alone in Canada, and “When the Grandmothers Meet,” about grandmothers in several locales around the world under severe challenges, reflect the inspired and inspired impact that grandmothers have on others. “Bedrock, Bedroll” is also written from the perspective of an old woman – one who remembers her itinerant life in the Great Depression as the wife of a miner following the work from place to place but finding joy in each other and in dancing together when their friends gathered at the end of the week. “Music in the Meadow,” Gathering’s finale, is a lovely reminder of the beauty in nature – a reminder to stop and appreciate the world in which we live. Maria’s is one of Canada’s finest and most perceptive singer-songwriters and the songs on Gathering are important additions to the Canadian folk music canon. The songs, and Maria’s singing, are exceptionally well served by the members The McDades who play throughout the album and by the occasional other singers and musicians who appear on select tracks. 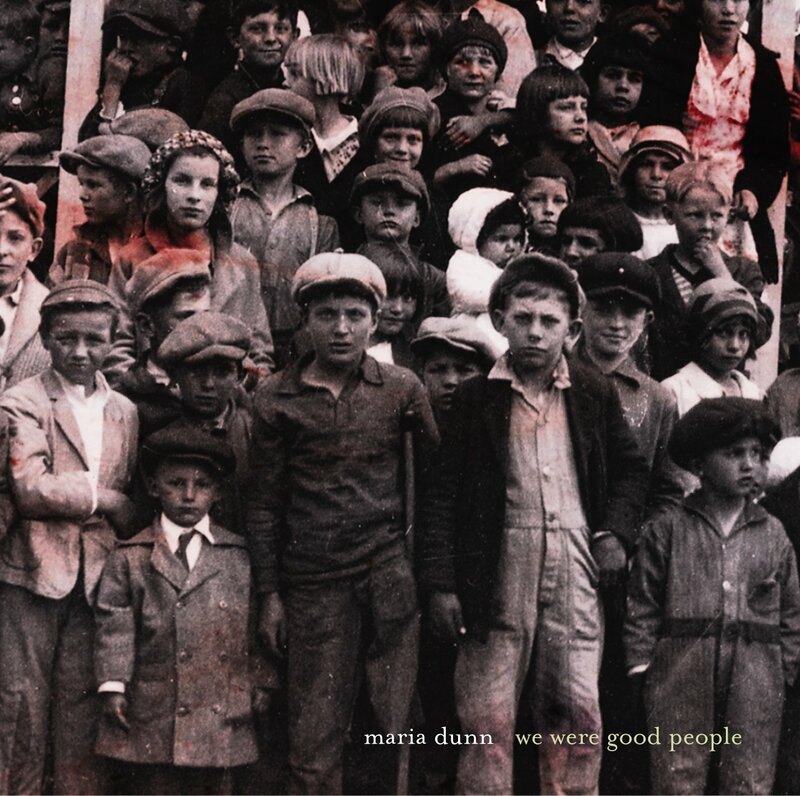 Maria Dunn remains one of the few songwriters in Canada to document the lives of ordinary working people. Piece By Piece, her profoundly moving latest recording, provides a social insight into a historical Alberta garment factory. EDMONTON - There are lots of great stories out there. You just have to know where to find them. 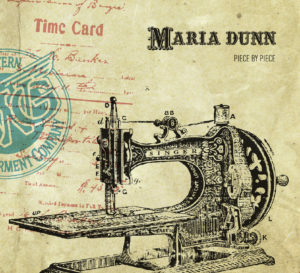 Singer-songwriter Maria Dunn found the stories for her new album Piece By Piece from the women who worked at Edmonton’s Great Western Garment Company (GWG), one of the most successful factories in the manufacture of denim clothing for 93 years before it was bought out and closed down in 2004. The project began over five years ago as a collaboration with Don Bouzek at Ground Zero Productions to do a multi-media show based on the workers at the plant. Dunn sat in on interviews between historian Catherine Cole and many of the women. There’s a great history of labour songs in folk music, but Dunn’s Piece By Piece takes it to another level. She found what was unique and universal about the experience of the factory workers and took great care to bring out their personalities in her music. Dunn captures their stories with real authenticity. Now their dreams, challenges and triumphs live on in her songs, with hints of their music too. On previous albums Scottish-born, Canadian-raised Dunn has leaned to Celtic stylings, but several tracks on Piece By Piece take on a more exotic feel with the addition of tabla drums from Ojas Joshi and sitar from Sharmila Mathur, and the number Lullaby draws from a song sung by a Vietnamese worker. Dunn’s supporting cast also includes players like Jeremiah McDade, Mike Lent and producer Shannon Johnson, and her own sublime vocals have a vibrant, enchanting tone. 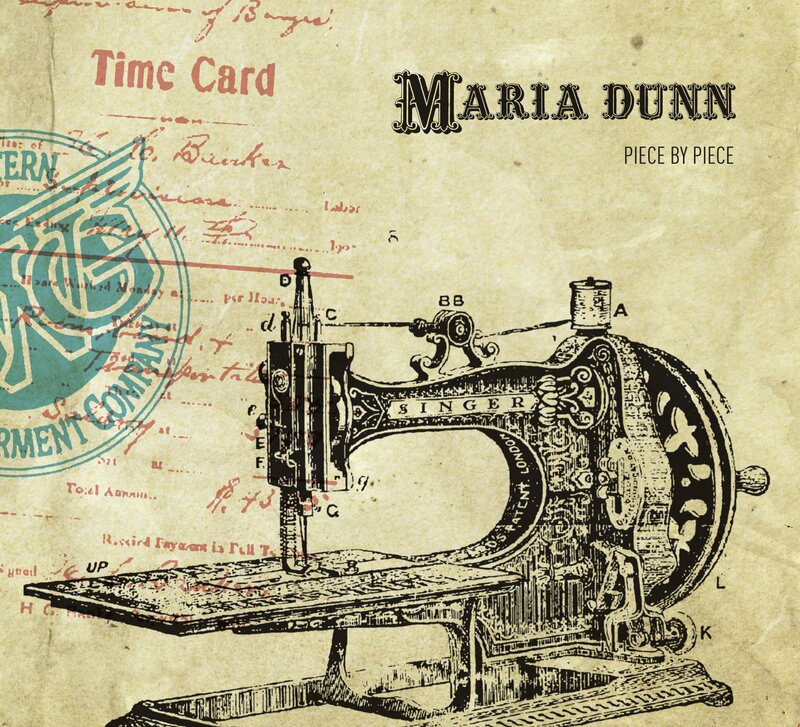 Maria Dunn launches into this CD no-holds-barred with the rollicking "Katie Comes a-Callin'." The McDades, a lively and talented band from Alberta, accompany her in this lively tune about a burst of sunshine into a cloudy life. Were it not for a line about not answering the telephone, it could easily be mistaken for a traditional tune. The remainder of the 10 songs on this CD tend toward the more serious and somber. Producer Shannon Johnson, Dunn's longtime friend and violin accompanist, masterfully produced this CD, imbuing it with a strong Celtic flavor, but with Dunn's own sensibility as well. Unlike many contemporary singer-songwriters, Dunn looks outside of herself for material and finds it aplenty--from a Mary Russell novel to contemporary politics. Perhaps the most powerful song confronts the listener on the second track. After lowering defenses with "Katie," Dunn delivers the knockout with "The Peddler," who is peddling war. With this song, she poetically excoriates those who sell war. The song seems inspired by a particular American former president. In "Tell Her I Was Brave," she takes the persona of the soldier trying to explain war to his lover at home with the beseeching final line, "Just tell them we were brave." She explores love, not the romantic kind, in "You Cant Take That Away," a song about losing a beloved sister. "Signal Hill" tells the story of a man who leaves home to earn a living in the oil fields, but realizes that living humbly on the land you love is worth more than a paycheck. Dunn writes historical narratives that easily convince you they're stories about real people and not characters she's invented. In the case of "Chavala, Eva," the person is real, a Polish Jew who immigrates to Canada in 1922. Dunn's songs resonate like traditional material. She's assured, strong, and her versatile voice carries her songs straight to the head and heart, while Johnson's arrangements infuse them with a taste of tradition and authenticity. Dunn has a real voice, and she can sing forcefully or gently. This is an interesting CD in the most positive sense. While in some contexts that may be faint praise, in the case of The Peddler, it's a bold compliment. Perhaps some of Dunn's songs will sneak into the tradition over the years. That's the highest compliment of all. It was Christmas in April at Folk Night at the Registry on Saturday. The seasonal atmosphere wasn't so much the result of Maria Dunn and Dave Gunning performing holiday songs, but rather because of the gift of fine songwriting they offered the appreciative capacity crowd. It was the first double-bill presented by the music series in three seasons and it was a generous delight from beginning to end. It turns out Dunn, who was raised in Ontario before moving to Edmonton, and Gunning, who hails from Pictou, N.S., have known one another since 1997. The coincidence added immeasurably to the concert in the way the two artists structured their sets. They shared the first set with Dunn opening with five songs over 30 minutes, followed by Gunning with five songs over 30 minutes. They performed the second 60-minute set together, with Dunn backing Gunning on accordion, guitar and harmony vocals and Gunning backing Dunn on guitar and harmony vocals. Dunn honed her accordion skills accompanying fiddlers during weekly pub sessions, and they proved a lovely complement to Gunning. For his part, Gunning is a better guitarist than he readily admits and his limber riffs filled spaces in and around Dunn's accordion and guitar. Dunn is more folk singer than Gunning, who is more singer-songwriter, but both share a deep sympathy with the plight of working-class people who muck out lives as best they can with decency and honesty. Dunn opened with the title track from her recent release The Peddler, a powerful critique on the marketing of war, followed by the title track of her sophomore album We Were Good People. She drew from the rich social history of Canada to sing about Alberta coal miners who risked their lives during prohibition, union activist Slim Evans who was jailed for refusing to send dues to fill American union coffers and Scottish coal miners who refused to work after traversing the Atlantic when they realized they had been hired as scabs in Nova Scotia. Dunn has a crystalline soprano that actually gains strength in person. It's the kind of voice that gives you goosebumps. Like Dunn, Gunning is an award-winning songwriter. He drew much of his material from his last two albums, House for Sale and Two-Bit World. Gunning falls within the tradition of his songwriting hero Ron Hynes in that he writes songs grounded in a strong sense of place. He's a quadruple threat with great songs and great voice, supported by strong guitar work and a self-deprecating, Forrest Gump sense of humour. He performed House for Sale, Saltwater Hearts, Hard Workin' Hands (co-written with Hynes) and a Texas hanging ballad co-written with James Keelaghan. His holiday song was a sad ditty about Santa drinking all dad's beer -- hilarious with a darker back story. Dunn's seasonal song, which brought the concert to a close, was God Bless Us Everyone, a song from the perspective of Charles Dickens' Tiny Tim that she performs every year with a group of Edmonton songwriters who breath new life into A Christmas Carol through song. Thanks to Dunn and Gunning, all in attendance at the Registry Theatre felt blessed Saturday night. "It's funny because I had no idea when I was growing up that I would be so interested in history," admits the Edmonton singer-songwriter. "I didn't find history in school very interesting or the teachers I had didn't know how to make it interesting. It's a tragedy really." It wasn't until her early 20s when she was able to travel back to her birthplace in Scotland and explore her family roots that history began to play a bigger role in Dunn's self-awareness. "I was able to read these letters that were exchanged between my ancestors and passed down in the family -- letters about how they made it through the Irish potato famine, which killed millions of people. I realized that if they hadn't survived, I wouldn't be here." On The Peddler, Dunn has tailored many songs to the form of Celtic ballads and reels so at first listen the album feels anchored in that folk tradition. But beyond the music and the singing -- some of the best she's ever done -- you pick up on the lyrical themes and a songwriter who is also pushing forwards. Moving stories of love, loss, cultural displacement, even pirates, and east-coasters coming to Alberta for work fill out the disc, and two songs about war have a timely significance. Tell Her I Was Brave is told from a soldier's perspective, while the potent, spare song The Peddler came to her on a trip back from Britain and the U.S. just before the start of the Iraq war. "I was watching the whole marketing phase that Tony Blair and George Bush were in to convince people that they needed to invade Iraq. It struck me that so much of the information that we were getting through the media had this marketing push, as if it had to happen, but when I spent time with real people in Britain and the U.S., I realized they didn't want it to happen." 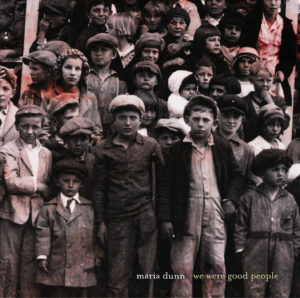 It's been a decade now since Dunn released her first solo album, From Where I Stand, followed by the Juno-nominated For A Song (2001) and We Were Good People (2004), a CD based on real-life historical threads about Albertans. Making The Peddler with the backing of The McDades in Montreal and Edmonton sessions over late 2007 and early 2008 brought her to a new creative plateau. "The studio process and my singing was all so much more relaxed and in the moment, coming from the last several years of performing and getting comfortable onstage. It's taken a while, but I've been able to shut off my anxiety and making music now feels less like work and more something I really enjoy." She credits Shannon Johnson for providing invaluable ears and advice as producer, a role she's played on all of Dunn's recordings. Johnson's fiddle, bassist Solon McDade, whistles and sax from Jeremiah McDade and guitarist Simon Marion complete a rich backdrop for Dunn's accordion and voice. It's been a busy year for the singer. Apart from finishing The Peddler, she toured, including her first feature-artist performance at the famous Celtic Connections Festival in Glasgow, Scotland, last January, a subsequent tour of the Netherlands, dates in eastern Canada, the U.S., and folk festivals. In addition, she's been creating more songs for a new project set to surface next year, another dip into a rich vein of local history. 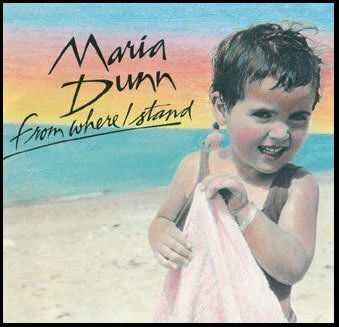 Good grief, it hardly seems like 10 years since Maria Dunn released her debut, From Where I Stand. It justifiably launched the career of a talented new songwriter. The followup, For A Song, received a Juno nomination. And while the honours went to David Francey's Far End of Summer, she could hardly complain about the company she kept. We Were Good People never quite received the same accolades, possibly because of its political bent. But it contains such remarkable songs as Can You Blame The Poor Miner? and From The Bread Line to the Front Line. 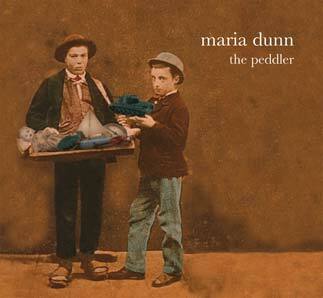 And so to The Peddler, the latest chapter in the Dunn canon. From the jaunty opening of Katie Comes a-Callin', you can tell there's something atypical at play here. Her singing is relaxed, more assured, her accordion more to the fore. Throughout, Shannon Johnson's production is clearly a cut above, with her McDade siblings firing on all cylinders all around her. As always, Dunn's songs cover a broad spectrum of topics with war (The Peddler, Tell Her I Was Brave) and migration (Signal Hill, Chavala, Eva, William McIlroy's) taking precedence. Chavala, Eva, with its undertow of klezmer soprano sax, is Dunn in peak form as she retells the colourful life of an immigrant seamstress. The Elder Sister, though, is a whole different kettle of custard with its gripping traditional narrative of jealousy and murder. Look for this song to have long legs. Truly, thereÕs never a dull moment with a Maria Dunn recording. Dare sample The Peddler's wares. Maria Dunn has discovered her inner historian--just in time for Edmonton's 100th birthday. What a coincidence. "I thought that it would tie in nicely," says the local folk musician on the release of her "historically themed" concept album, "We Were Good People." Dunn performs tomorrow night at the Provincial Museum. For those unfamiliar with this remarkable singer-songwriter, think of her as a distaff Woody Guthrie--a notion made clearer with some new pro-union songs that sound as though they could've been written 100 years ago. While it's maybe a bit early in her career to hurl that kind of praise around, Dunn is a formidable talent. During her Junofest show this spring, schmoozing came to a halt as she held the crowd with nothing more than her voice and accordion accompaniment. "We Were Good People" was inspired by her stint as an artist in residence at the Edmonton District Labour Council -- more specifically by eyewitness accounts of the "Edmonton Hunger March" in 1932, a peaceful protest that turned into a riot. Says Dunn, "I came across a letter written by a fellow named William Dolinsky. He wrote very eloquently about how hard the conditions were in the Depression and how people went out to try and make their message known to the government, and they ended up in this sad and violent ending to the day. He just summed it up so well at one point. 'We were good people. I don't understand how this could have happened.' I thought it was a beautiful way of expressing the disappointment, the sadness, when an event like that turned out so differently from what people had hoped." Dunn's third album focuses on Alberta's first 50 years as a province with what sounds like authentic language and a Celtic-bluegrass hybrid that gives the whole thing a "Cold Mountain" in Alberta feel. There are songs about beleaguered union men, worker's plights, voting rights and the general hardship of being an Albertan in the early 1900s. Many of the stories you won't hear from the centennial celebration cheerleaders. "Some people would say that I'm naturally drawn to the sad songs, but I am drawn to telling stories of the underdog," Dunn says. "I'm interested in people who face adversity and somehow come through it. I find their resilience very inspiring-how some people can live through experiences and come out the other end and not be bitter and have handled things gracefully. That's part of what interests me in writing about these events. "I think it's important for us to remember that life isn't always easy. It wasn't always easy. And maybe if people can connect in some compassionate way with what the characters in the songs experienced, I think that's a good thing. It gives us a richer understanding of our history and hopefully a richer understanding of the situation in the world as it is today." The record opened up worlds of possibilities for the 38-year-old songwriter. In researching, writing and recording "We Were Good People". Dunn says, "I've discovered this historian in me that I never knew was there. So if 20 years from now, I'm tired of the road, maybe I'll go back to school and do a history degree." Not yet, though: There's work to do. The petite songstress takes enormous risks with her third album, delving into Alberta's labour and pioneer heritage for a collection of songs that speak of real people experiencing life within challenging circumstances. That the album doesn't come off as a staid history lesson is a compliment to Dunn and her roving band of compatriots including Shannon Johnson, Craig Korth, David Ward, Byron Myhre, and the McDade Brothers. On For Peace or Plenty Dunn sings, "We did not know the future, at least we know our past;" after allowing myself to learn from these ten numbers (and the extensive liner notes), I feel I have a stronger grasp of this province's foundation. That all this comes in a crackerjack of a folk album- one that is singalongable, bouncy, and spirited is no small feat. Dunn is Alberta's premier songwriter. Dunn succeeds in creating a second recording every bit as dramatic, interesting and impressive as her first effort. She writes and sings with cleverness absent in the milieu of contemporary singer-songwriters. Although richly produced by Shannon Johnson with mainly acoustic and sometimes electric instrumentation, the overall sound pays homage to a traditional feel. Several tracks scintillate with a lively bluegrass accompaniment. Nearly all the tracks include a variety of male and female harmony vocals, although there's nary a need to obscure Dunn's own assured and pleasing voice. She proves this in her a capella performance in English of the traditional "Gra Geal Mo Chroi." Dunn hails from Alberta, Canada, but her music strongly reflects her Irish heritage, especially her way with a tune. The dozen songs, 11 original and one traditional, range from "Maggie Thompson," a ghost story based on a book about the massacre of a farm family, to "The Lingan Strike" about a n 1882 Cape Breton miner strike. A pair of songs, "Take It Easy On Me", and "What Did I Do?" back-to-back on the disc make an interesting pair. The former is a plea for social justice for the downtrodden, while the latter, ostensibly a romantic song, is a personal question. "Nan McGowan" stands up for her safety and dignity in throwing out her loutish drunken husband. Nearly all the songs are narratives or stories of people who either made a mark on the world, or on whom the world made a mark. "God Bless Us Everyone" written from Tiny Tim's perspective in Dickens' A Christmas Carol is a terrific conclusion and a tonic for our times. For A Song definitely establishes Maria Dunn as a major figure among singer-songwriters. 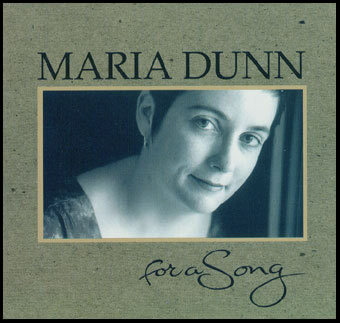 Readers of Acoustic Corner will be familiar with Edmonton singer/songwriter Maria Dunn, whose appearance at the 2000 Stan Rogers Folk Festival was a striking revelation. For many music fans, the best part of frequent attendance at festivals is often the exposure to artists of whom one had previously been unaware. Dunn's appearance at the 2000 Stanfest left may of those in attendance asking themselves how they had so far missed finding out about this singer and songwriter. FOR A SONG is Dunn's second independent release, following on 1998's FROM WHERE I STAND. FOR A SONG was a finalist nominee for the 2002 Roots/Traditional Juno (which was won by David Francey's FAR END OF SUMMER, which was also recently reviewed in this column). Dunn's approach to music seems to draw on three disparate yet related threads of source traditions. The first is the female singer/songwriter tradition (I hear traces of songwriters like Nanci Griffith and Lucy Kaplansky in several tunes). The second thread is the Celtic folk sound, which is greatly enhanced by the instrumental accompaniment of Shannon Johnson (fiddle) and Craig Korth (banjo; dobro; guitar), the Canadian-Celtic band The McDades and the harmony vocals of Con O'Brien of The Irish Descendents. The final root source is clearly bluegrass, where Dunn is instrumentally backed by perhaps Canada's finest bluegrass outfit, Jerusalem Ridge. FOR A SONG is one of those rare releases that holds up well after repeated listenings. It is also one of that select group of recordings where I can honestly report that there is not, to these ears, a single weak filler tune. At first listen, I assumed that I was hearing a number of traditional tunes interspersed with Dunn's own writings. On closer inspection, I discovered that all but one tune are Dunn originals, the exception being a hauntingly beautiful a capella rendition of the traditional Newfoundland song "Gra Geal Mo Chroi". As mentioned, there is not a disappointing cut on the album, but a few in particular stand out. "Maggie Thompson" is a feminist take on the notorious Donnelly family murder which occurred in Ontario in 1880. Maggie Thompson was the girlfriend of one of the Donnelly brothers who, according to local legend, returned to the courthouse each year on the anniversary of the massacre to futilely demand that justice be done. Referring to the same historical period, "The Lingan Strike" refers to the 1882 coal miner's strike in the Cape Breton town of Lingan. It tells the story of miners from Scotland who were brought to Cape Breton by the mine owners in order to break the new union, but when they arrived and discovered why they had been brought over they refused to do so. The tune gives ample demonstration of Dunn's mastery of the Celtic vocal style, with its swooping elisions and embellishments. Graham Burley on the lowland pipes and Shannon Johnson on fiddle provide the tune with its distinctive Celtic sound. Finally, "Lonesome and Then Some" give ample proof that Dunn is equally at home in both writing and performing solid bluegrass. Propelled by the stellar 5-string banjo of Craig Korth, this tune practically radiates sunshine. Many a singer/songwriter is capable of writing exceptional tunes (although seldom an entire album's worth), and there are a number of albums in this genre that are distinguished by exceptional playing and recording. However, seldom do you find both in the same release. Given the Celtic and Maritime nature of many of her tunes, perhaps it is time to make Maria Dunn an honorary member of our community! Let's get one thing straight: Maria Dunn is not a singer-songwriter. Yes, she's a singer. And yes, she writes songs. But don't confuse her with those miserable, touchy-feely, guitar-strumming sods bemoaning some blackguard who absconded with the family cat. Nah, our Maria belongs to a tradition as old as time itself. Her songs tell stories about real events and people-heartbreaking tales about indentured orphans used for slave labour in rural Canada in the last century, or the reflections and aspirations of the old but yet defiant downtrodden. Her debut disc, From Where I Stand, had all that and more. For A Song takes up where its predecessor left off, covers similar colorful ground, shows rewarding all-round progress, and offers a track that deserves its place in the same pantheon of traditional classics as The Parting Glass, God Bless Us Everyone, indeed. At the heart of this disc is the superb subject matter. Maggie Thompson offers a unique take on the murder of Ontario's "Black Donnelly's". The Lingan Strike tells an uplifting tale of union organizing amongst the coal miners of Cape Breton. Heather Down Road relays the independence of spirit gleaned by women working in non-traditional jobs during WWII. And, Nan McGowan defiantly rebukes institutionalized values of wives putting up with drunken husbands. As poignant as these social comments surely are, they are often dressed up in a disarming lightness with fiddles, pipes, whistles and banjos, courtesy of Shannon Johnson's sympathetic production. Truly, Johnson uses broader but seamless strokes as Dunn flits across folk, country, bluegrass and even an unaccompanied Gaelic air, Grà Geal Mo Chroí. Lester Quitzau's discriminating dobro playing on the gorgeous Take It Easy On Me, being an unquestionable highlight alongside the rousing Gaelic choral arrangement of Poor Lonesome Hen. And if Ramblin' Jack Elliot ever felt the need for new material, he need look no further than the gorgeous Whiskey Evening. An immensely satisfying disc, this, full of optimism and substance. Celtic. Bluegrass. Celtic. Bluegrass. For many artists, it would have to be one or the other. You wouldn't want to piss off Celtic music aficionados by playing that backwoods bluegrass stuff, would you? And why alienate landlocked bluegrass fans by exposing them to songs about shipwrecks and, um, shipwrecks? But for Edmonton-based Maria Dunn, music isn't about limiting yourself to just one genre. Like her debut CD, From Where I Stand, the follow-up For A Song refrains from following any preconceived notions about what a CD should sound like. For A Song (which, by the way, doesn't actually contain any tunes about shipwrecks) boldly kicks things off with a murder ballad, then merrily alternates between traditional-sounding numbers that meld folk, bluegrass and country sounds, and tunes strongly influenced by East Coast and Celtic traditions. Clearly, Dunn is following her own musical rules. And it works. Originally born in Scotland, Dunn's family moved to Sarnia, Ontario when she was still an infant, and then to Edmonton when she was 10. That alone is enough to explain her interests in different genres. "I really think that my music is a result of the influences I've experienced in my life," she says. "Obviously the Celtic influence comes a bit from my background, but I also grew up with my dad playing Johnny Cash and Lonnie Donegan songs, and country blues stuff, so I think there was a Western influence there as well. I think both things are suited to my voice and singing style, and that's probably what makes it more likely that I am going to write or sing in those styles." While the bluegrass-folk-country sound makes sense given Dunn's Alberta address, listeners are often surprised when they hear her Celtic and East Coast sides, which trick the ear into thinking she's lived her entire life by the sea. "People often come up and ask if I'm from the East Coast, which I always consider a compliment because I love the music from Cape Breton and Newfoundland," says Dunn. "When we moved to Edmonton, we lived in Sherwood Park, so we didn't even have a river valley. It was very depressing for me." Dunn has since grown to appreciate her home, and her prairie roots are now winding their way into her songs. "I think for a long time I really resented (moving to Alberta). Let's just say, through a pre-teenager's eye, it was a bad move. But we have a pretty amazing history in this province, and there are tons of stories to tell. I'm really enjoying getting into it." 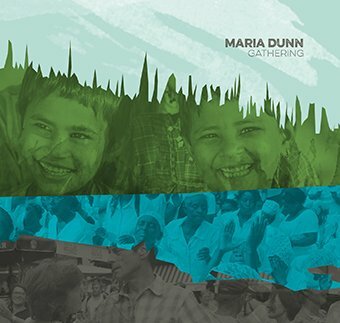 It is her finely honed talent for storytelling that seems to form the root of Maria Dunn's music, regardless of the style she happens to be playing-a point made clear when she explains why she chose For A Song as the title for her CD. "There's such pleasure and satisfaction in writing a song," she says. "I work hard at being an independent musician, and to me, the ultimate reward is creating a song that I'm proud of and feel good about. And when I get lost in the day to day paperwork or emails or all of the things that I am supposed to do, I really have to come back to why it is I'm doing this, and that's why." Dunn is an Edmonton, Alberta based contemporary songwriter and the Celtic undercurrent in her writing undoubtedly sources from her Scottish ancestry. Apart from the traditional Irish tune Gra Geal Mo Chroi [translated Bright Love Of My Heart], the other eleven contributions are Dunn originals. Possessed of the neat phrases "I'm just finding my way to the promised man" and "And dirt poor's not the same as dirt," the coming of age love song Take It Easy On Me is reminiscent, lyrically and vocally, of Betty Elders at her best. Apart from electric bass, Dunn and her support players principally employs acoustic instruments to support her words. Elsewhere on the collection there's The Lingan Strike, a tale of miners brought from Scotland to Cape Breton in 1882 to break a strike by the local pit workers. "We'd rather make it empty-handed back across the sea, Than rob our Gaelic brothers in their fight for dignity," adequately describes the outcome. Lonesome And Then Some is a fast paced, bluegrass fuelled love song, while Heather Down Road is a tribute to the Edmonton women - Angels - who instructed pilots as part of the British Commonwealth Air Training Programme during World War II. In the world of self-financed recordings, Dunn's For A Song is a sparkling and precious rarity. Needless to say, when a really great song jumps out at you, one that works its way into the bloodstream, making all your atoms vibrate every time you listen to it, you know you're onto something good. This was the case with Whiskey Evening. A stand-out song. This songwriter from western Canada shows her Scottish roots on her first solo recording. Dunn's original songs are lively, using simple but full-sounding backing (guitars and bass, with violin and whistle). Her strong, dramatic vocals are supported by harmony vocalists Shannon Johnson and Dawn Anderson. Dunn's songs mostly have a traditional Celtic sound to them, but a few add in elements of bluegrass. Melodic, fun music from an artist to watch out for.